Elizabeth Bramkamp is a Taste of Home magazine Field Volunteer. As I have mentioned before in some previous blogs, I have received dozens and dozens of cookbooks from these wonderful Field Volunteers to help rebuild The Culinary Cellar after the flood last summer. Elizabeth included a heartfelt note about how she is also a cookbook collector, starting when she was just ten years old. She spoke to my heart, and that of every cookbook lover, of how she loves all the smeared pages of that old book, with hands covered in cookie dough, and a now-loose binding. 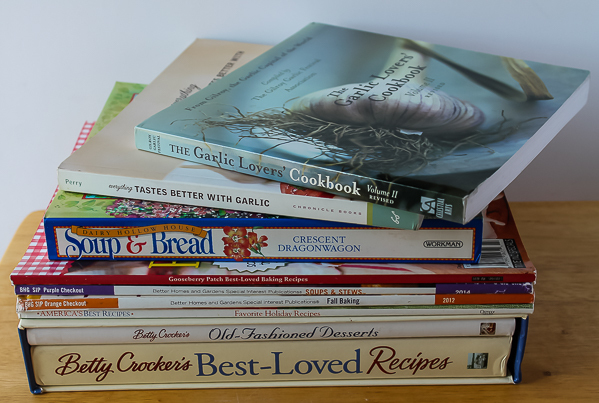 As she says, “Our cookbooks are so much more than a collection of recipes. They are an extension of who we are.” I couldn’t have said it better, Elizabeth. This is the lovely group of books sent by Elizabeth. I was thrilled to see the two Betty Crocker books as I had lost those in the flood. Since I love garlic, I had to choose a recipe from one of those two garlic books. 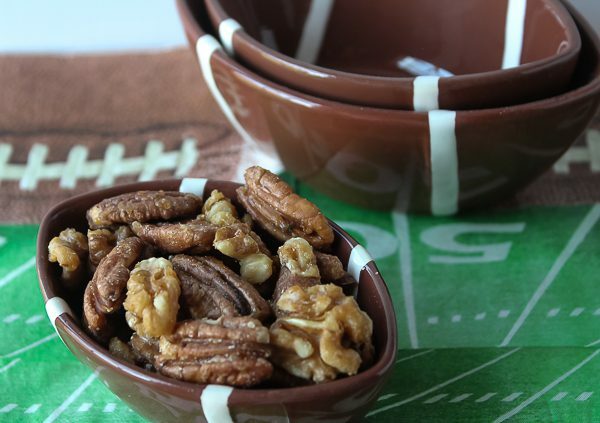 It also happens to be Super Bowl Sunday this weekend, so what better recipe to find than a fun munchie for the game. 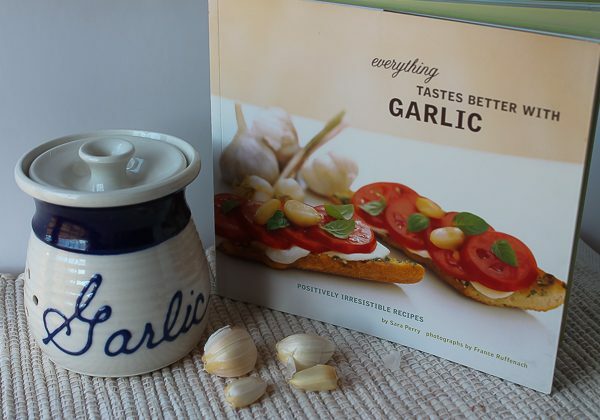 This great cookbook has recipes using garlic in every way: dips, soups, salads, breads, pizza, sandwiches, pasta, risotto, meat, poultry, seafood, and vegetables. 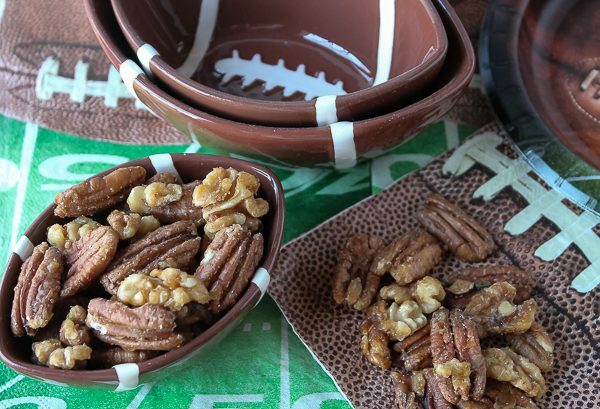 I went to the chapter of “Hip Dips, Small Plates, and Little Teasers” to find Happy Hour Bar Nuts, for a Super Bowl treat. They are savory, slightly sweet and salty, and completely irresistible with a garlicky bite. These are so good. My husband who is not a huge garlic fan, loved these. I don’t know if they will last until the game on Sunday! Thank you Elizabeth, for your thoughtful gift of books. They have a happy home in The Culinary Cellar! Preheat oven to 350 degrees. Line a rimmed baking sheet with foil or parchment. In a large saucepan, melt the butter over medium heat. Add the garlic and saute for one minute. Add the brown sugar, water, rosemary, and garlic salt, and saute, stirring constantly, until the sugar is no longer dry and the mixture is shiny and wet. Add the nuts and toss to coat. 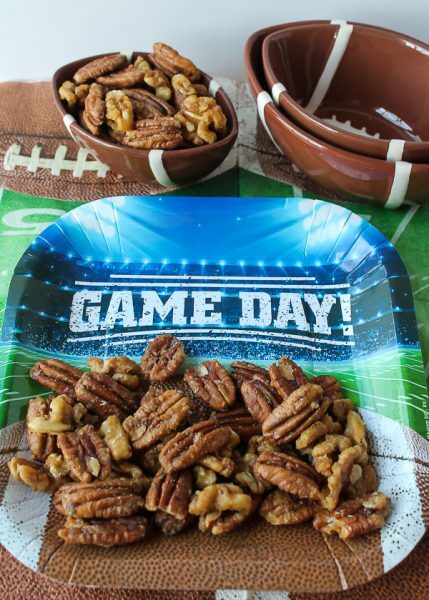 Spread the nuts on prepared baking sheet in a single layer. Bake for 8 minutes, then remove and toss nuts again. Return to oven and bake until lightly browned, about 6 minutes. Remove nuts from oven and immediately sprinkle with a little more garlic salt, then toss again, scooping up any coating left on the foil. Slide the foil onto a wire rack and allow the nuts to cool completely. Store in an airtight container.